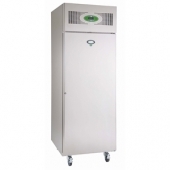 Below is additional information on the hire item "Upright Gastro Freezer 600 litres". Dimensions 2100(h) x 700(w) x 800m(d)mm. Compact refrigeration system and concealed fan and evaporator to maximise storage space. Volume Price £ 195.65 for orders of 2 units or more.